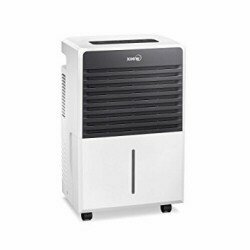 The latest Winix 70 Pint Dehumidifier 70BT is the more powerful unit in a two model range from this South Korean manufacturer. It is suitable for use in a basement or other area of the home with a floor area of up to 1200 square feet. It will operate most effectively at a comfortable room temperature but is not the best choice for a cold basement (below 41°F). This appliance is easy to operate and includes features such as an on-off timer, variable fan speed and an easy to read humidity display. Unlike the previous model the 70BT does not include a condensate pump although it will drain continuously, through a hose, into a convenient outlet if you do not want to empty a bucket once or twice a day. The dehumidifier has a pleasing, modern look to it but, more importantly, it is Energy Star™ qualified and comes with a 12 month manufacturer's warranty which may be extended to three years for a modest additional payment. It is a compact unit for its power and relatively quiet while running. Those of you who dislike continuously running fans will be pleased to read that the fan on the Winix 70 pint dehumidifier runs only while the unit is dehumidifying. The Winix 70 pint dehumidifier 70BT is a powerful appliance which will remove up to 70 pints of water from the air every 24 hours. The actual amount removed will reduce as ambient temperature falls but it will have no difficulty in maintaining a humidity level of 50% in an enclosed area of up to 1,200 square feet at typical room temperature, which should be comfortable for most of you and low enough to prevent black mold growth. The appliance has been independently tested and achieved the stated 70 pints per day extraction rate in the AHAM standard testing conditions of 80°F and 60% Relative Humidity at which all portable dehumidifiers are compared. Many of you will be looking for a dehumidifier for your basement. The Winix 70BT is suitable for a small to medium sized basement but, like all portable units it has its limitations. Some basements are cooler and/or wetter than others and for more extreme conditions a commercial dehumidifier is the only effective solution. If your basement is cold, below 55°F - 60°F for much of the year, a portable dehumidifier can be expected to struggle to achieve the results you expect. This will also be the case if the basement is very wet for any reason when a dehumidifier capable of drying the air to a very low level, below 20%, would be required to draw out the moisture from the fabric of the building. If your basement is divided into more than one room this will also degrade the performance of any dehumidifier. A partial solution would be to leave all doors open and to improve the air circulation by using one or more fans. A more elegant solution is to use ducting to remove, dry and replace the air but this too requires a different type of dehumidifier as no portable models are equipped for use with ducting. The Winix 70BT is configured for continuous drainage by which the condensate, the water collected from the air, can be fed to an adjacent drain through a short length of plastic hose. If there is no suitable drainage point at floor level this option cannot be used and a condensate pump would be needed if you wish to avoid regular trips to empty the water bucket. Some dehumidifiers have a feature called auto-restart whereby the unit will resume operation automatically following a power outage. The Winix 70 pint dehumidifier does not have auto-restart. If this feature is important to you this model is not the one to buy. The 70BT has an excellent humidistat which enables the user to set a preferred humidity level ranging from 35-70%, in increments of 5%. Some users will have medical reasons or a preference for a setting at one or other of these extremes but for comfort and the preservation of your home a level of 50% will be appropriate for the majority and less costly than a lower setting. All dehumidifiers need an air filter to remove dust and other particles from the air as it is drawn into the appliance. The function of the filter means that it will, in time, become ever more coated with this debris. If it is not removed the dust will degrade the performance of the unit and, in extreme cases, can contribute to the appliance catching fire as you will no doubt have picked up in the news media from time to time. It should be removed and cleaned every one to two weeks and the filter in the 70BT is washable to make cleaning more effective. As with most other brands and models the 70BT has an automatic defrost feature. Most dehumidifiers work by cooling a metal coil and drawing ambient air across this coil where the water vapor in the air condenses on the cool metal. So cold is the coil that from time to time ice forms on it which degrades performance. When this happens the appliance senses it and stops cooling the coil while continuing to draw air across it to melt the ice. When the ice has gone it starts to do its work once more. Ice on the coils is normal but when it is very cold that ice takes longer to melt which is why a portable unit is less effective in colder conditions. An auto-timer on this model is one of its best features. This control allows the user to program the unit to run for 3, 6 or 12 hours or to turn itself on up to 12 hours in advance. Finally the Winix 70 pint dehumidifier allows you to choose between low, high or automatic fan speeds. Click on the link to download the Winix 70 BT Manual. Winix units are sold in lower numbers than better known brands such as Frigidaire and the number of consumer reviews is smaller too. The reviews that are available are predominantly favorable although, as with other brands, there are a small number of purchasers who have received faulty products. Satisfied customers mention competitive pricing, quiet operation, build quality and appearance as the main benefits and many report that the Winix performs as well or better than other brands they have tried. The most common complaint is the absence of auto-restart to switch on the appliance automatically following a power outage. On balance, however, the reviews suggest a generally high level of customer satisfaction. The Winix 70 pint dehumidifier model 70BT is a sound, well performing and stylish appliance on a par with the best brands in its market. The majority of users who have reviewed this unit have expressed satisfaction with it and a number have commented on its quietness compared with other brands they have owned. The principal complaint is the lack of an auto-restart feature and, if this is something you need this is not the machine for you. For others it may be inconsequential while for a few this might be seen as an advantage if it prevents the machine from restarting at a time when they might not usually make use of it. Subject to this one qualification the Winix 70BT is a dehumidifier that can be recommended for many users and it should give excellent service during its working life.